As I mentioned earlier, all of the IVB-E launch SKUs ship fully unlocked. Intel offers multipliers up to 63x for you to choose from when overclocking. Like SNB-E before it, IVB-E supports specific BCLK straps (125MHz and 166MHz, in addition to 100MHz) for those overclockers looking to get the absolute most out of their chip. At these overclocked BCLK frequencies, PCIe and other buses are properly divided down so they aren't overclocked (although if you increase the BCLK frequency beyond these strap defaults you will once again be overclocking other buses that derive their frequencies from BCLK). In practice, the cleanest/simplest way to overclock any K-series SKU is by increasing the multiplier. 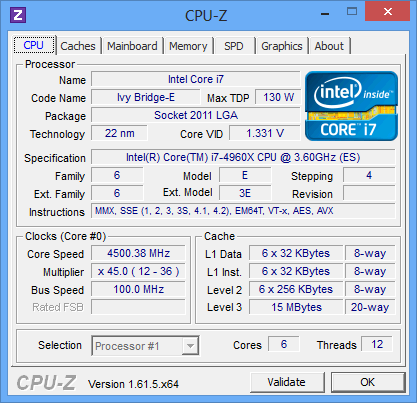 In our review of the Core i7-3960X I managed a maximum stable overclock of 4.6GHz. I've been told to expect a similar average for Ivy Bridge E. Using Intel's RTS2011LC self contained/closed loop liquid cooling solution I could get into Windows 8 as high as 4.6GHz at 1.42V, however my testbed wasn't stable through all of my tests at that frequency/voltage combination. Moving to higher voltages didn't help, so I had to back down on frequency. I ultimately ended up perfectly stable at 4.3GHz, with 4.4 - 4.5GHz possible with better cooling. The added power needed to hit these frequencies was substantial. 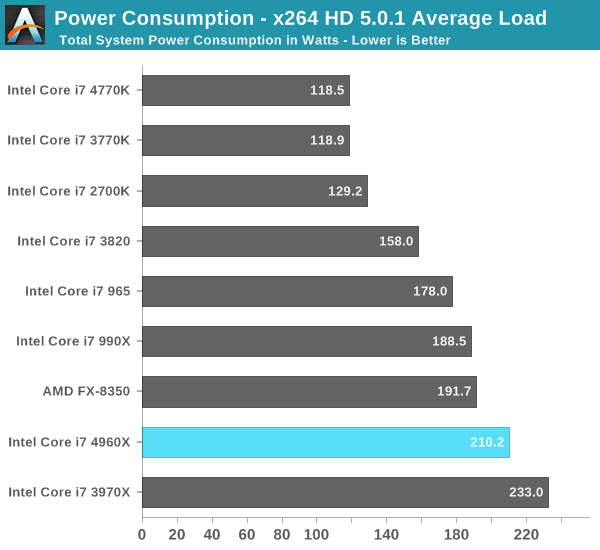 I measured a 58W increase in average load power consumption at 4.3GHz/1.4V. From what I've seen, my sample is a bit on the disappointing side in terms of overclockability. Either way, it doesn't look like you're going to be seeing overclocks significantly higher than what was possible with SNB-E.
With the 4960X delivering around 5% better performance than the 3970X, the only remaining question is how much more power efficient the move to 22nm made things. Using the same ASUS X79 Deluxe board for both parts, I was able to answer that question. At idle there's hardly any difference between SNB-E and IVB-E. 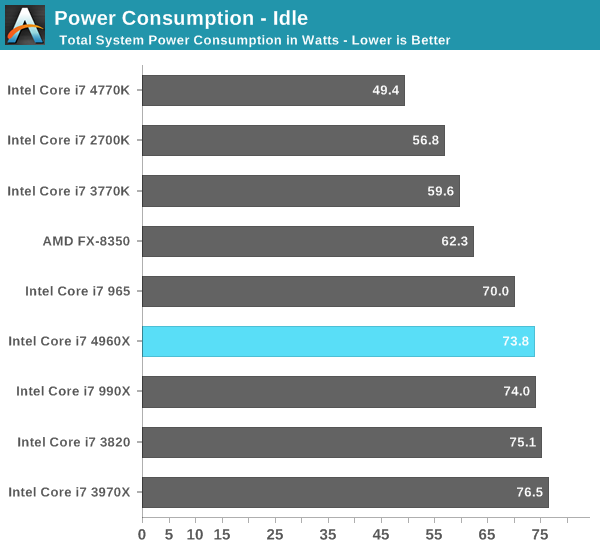 Under load it looks like IVB-E is good for around a 20W reduction in total system power. It's not an insignificant savings, but definitely not enough to warrant an upgrade if you're on SNB-E already. Anyone looking to migrate to LGA-2011 for the first time will want to go with IVB-E as it is the more thermally efficient solution. Still running i7-950 system (was an i7-920 back in 2008) and all I've upgraded since building it is a small bump in CPU speed, added water cooling, and installed two GTX660's in place of two GTX460's installed in 2010, which replaced the Radeon 4870x2 from the original 2008 assembly date. I've also replaced the original 500GB Seagate Boot Drive from 2008 with an Intel 160GB X25-M in 2010. Still use the same SSD to this day. Same motherboard, same 6x2GB G.skill DDR3-1600 modules (that cost $600 back in 2008) and same PC Power & Cooling 750-QUAD. I've added a USB 3.0 PCIe controller as well. Overall, this is the longest (5 years) I've ever owned a system that retained the same motherboard. The irony is Intel discontinued Socket 1366 so fast it wasn't even funny. It was actively supported less than 2 years, and only 2 generations of chips (using the same architecture and process) were made within a year of each other, essentially giving this socket a 15-month lifetime. Yeah, for 1366 owners, there's absolutely no reason to upgrade, especially with overclocking. At least you got one generation of upgrades, unlike 1156 owners who got completely screwed. What does this have to do with chizow's comment about the closed-loop cooler?? Absolutely nothing. I'm guessing it was just an easy way to get posted near the top. Probably within 1-2C of similar "extra wide" 120x37mm closed-loop coolers. Looks like Intel's solution is made by Asetek going by it's block and mounting design, so I'd compare it against the Antec 920 for starters.